INITIATORS - who?, when?, what? Arch. Jeko Tilev is one of the most popular and celebrated at international level Bulgarian architects. He is born on 26. 08. 1950 in the city of Simeonovgrad, Bulgaria. In 1969 he graduated from the technical high school of Stara Zagora city with excellent marks. In 1974 he graduated with distinction the University for Architecture, Construction and Geodesy in Sofia, Bulgaria. In 1991 he became an associated professor and specialized “Technology of the architecture” in the Faculty of Rome Architecture. He speaks French and Russian. 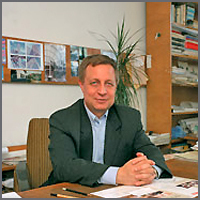 Since 1995 he is the head of department “Building construction”, part of Faculty of Architecture of the University for Architecture, Construction and Geodesy. In 2002 he founded Tilev Architects Ltd. Among the many famous projects of his are: the Great Egyptian museum – Egypt, the Olympic complex in Insbruk, Astria with the reconstruction of a part of the complex. - Laureate and a gold medal winner of the XI World trianale “Interarch” 2006 in Sofia and a medal from UNESCO for the architectural project for "Seuthopolis". - A golden “Vizar” in 2005 at the European awards for the architectural project "Seuthopolis". - Architect of the year 2003. - Laureate and a silver medal winner at the X World trianale “Interarch” 2003. - Professor of the year for the faculty of Architecture of the “University for Architecture, Construction and Geodesy” for 2003 and 2004. - Inclusion of one of his projects in the chart for the 12 buildings of the year by SCHUCO, publication in the catalogs and the yearly calendar of SCHUCO for 2003. National Unity "Treasure the Bulgarian Heritage"
National Unity "Treasure the Bulgarian Heritage" is one of the most popular NGOs in Bulgaria. The main priority of the organization is the work for the social society and the young people in various aspects of life. Main goals of the organization are the preservation and development of the Bulgarian cultural, historical and social values, the integration and development of the European values in Bulgaria. The activities of National Unity "Treasure the Bulgarian Heritage" are orientated towards the participation and involvement of young people in campaigns, programs and initiatives at local, national and international scale. The organisation partners successfully with many Bulgarian and foreign government and non-government organizations. - We have introduced to the wide public internet campaigns called "The Bulgarian House" and "The European Union House" which include the symbols – anthems, flags, financial symbols, etc; and every person can download them for a personal use. - National Unity "Treasure the Bulgarian Heritage" holds a yearly youth forum, at witch it gathers many youth organizations, NGOs, government institutions and citizens. - Doichin Kotlarov, legal council of National Unity "Treasure the Bulgarian Heritage"
The initiative of National Unity "Treasure the Bulgarian Heritage" for the restoration of the ancient Thracian city of "Seuthopolis" is part of the ideal project planed by architect Jeko Tilev constructed in 2005 for the unique conservation and use for tourism purposes city. The "Seuthopolis" project has the ability to fully rediscover, show, conserve and use the Seuthopolis archeological site for tourism. By the project "Seuthopolis" many ways for education, tourism, cultural and ecological activities will be able to be implemented and accomplished. The idea for exploring the city of "Seuthopolis" that was left under water came to the mind of arch. Jeko Tilev after the municipality of Kazanlak turns to ask his professional help in order to excavate and "return" this cultural monument to the city of Kazanalak. They offered him to make a copy of the city in a new site away from the dam, but arch. Tilev abandones the idea of making a fake copy of such monument. He challenges his professionalism and ideas and comes up with the project and marks it up in 2005 as you see it now in this site. Despite the help and support of many people and organizations the project isn't moved forward until the spring of 2007. Then in March young people acquainted with the project ask for help the National Unity "Treasure the Bulgarian Heritage" in order this project to be accomplished and realized. So in the beginning of the summer season of 2007 a meeting between arch. Jeko Tilev and his colleagues and the National Unity "Treasure the Bulgarian Heritage" takes place during which the National Unity offers a plan of steps and activities in order this unique project to be accomplished. In September 2007 arch. Jeko Tilev and National Unity "Treasure the Bulgarian Heritage" sign an agreement with which they formally start the national initiative "Seuthopolis"